The Corps of Engineers announced March 27 that it will expand its program to reduce avian predation on juvenile salmonids in the Columbia Basin by allowing the "lethal removal" of some gulls and cormorants from five dams--McNary, in the mainstem Columbia, and the four projects on the lower Snake River. The effort will target up to 650 ring-billed gulls, 1,200 California gulls and 150 double-crested cormorants. In a statement, the Corps said it adopted a 2011 USDA Wildlife Services' environmental assessment on bird damage management in Washington and signed a finding of no significant impact on March 14. Between 1977 and 2009, the ring-billed gull population in the Columbia Basin has grown from about 17,000 to 30,000 birds, according to the EA. California gull numbers have grown from 9,000 to 38,000. 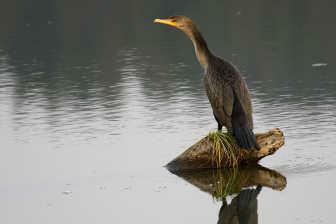 The finding of no significance said up to 750 double-crested cormorants could be lethally removed with no adverse effects on the overall population. About 1,000 breeding pairs were estimated to populate four inland Washington sites, not many compared to the 15,000 pairs in the Columbia estuary. The EA noted, on average, 51,652 double-crested cormorants were harassed, and 202 killed per year from FY 2006 through FY 2010 for projects associated with the assessment. The Corps said it will continue its non-lethal hazing program as well, using fireworks, noise, water-spray cannons and passive deterrent structures to keep birds away from juvenile salmonids.